We construct amodel of space-time structure on the basis of the operator field theory. Instead of a world point, the carrier of possible local events is assumed to be a universal supermatrix complex U which comprises a complete set of local field operators. A basic element of extension is described in the model by an equation of a special commutator algebra closed on two such local complexesU 1 and U 2, “nearest” in the lightlike connection and connected by one vertex of virtual interaction of fields. The corresponding causal relationship is interpreted in the classical picture of the description as a lightlike line closed as a “figure-of-eight” loop, and in the quantum picture as a symmetric T-time jump (reflection) between the nearest local past and future. 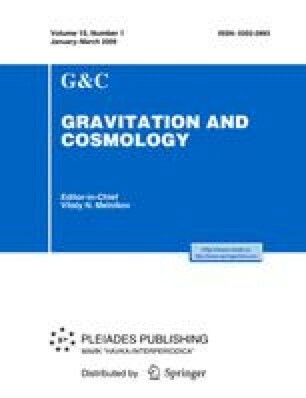 The discrete nature of the constructed “quantum proximity” equation, containing the gravitational constant, is associated with the existence of a local curvature on the Planck scale. The algebraic closedness of the fundamental equation suggests that the charge symmetry group should be E 6 with non-standard representations for fermionic and scalar fields. The model also makes it possible to consider the symmetric two-way time flow as a chain of local T-reflections.